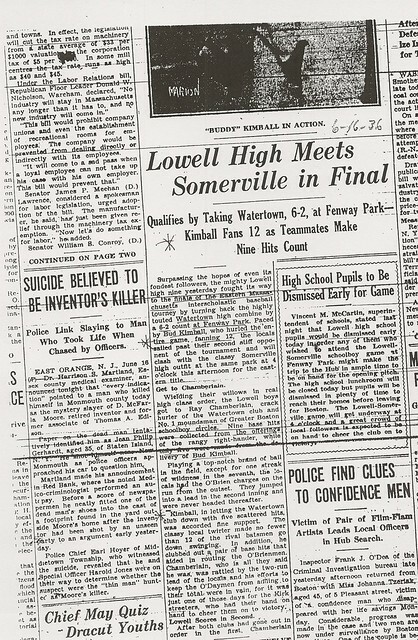 One of the outstanding performers of the golden age of athletics at Lowell High School during the 1930’s, Leighton “Buddy” Kimball rightfully takes his place in the pantheon of legends who strode the hallowed halls of Kirk Street during those halcyon days of that bygone era. 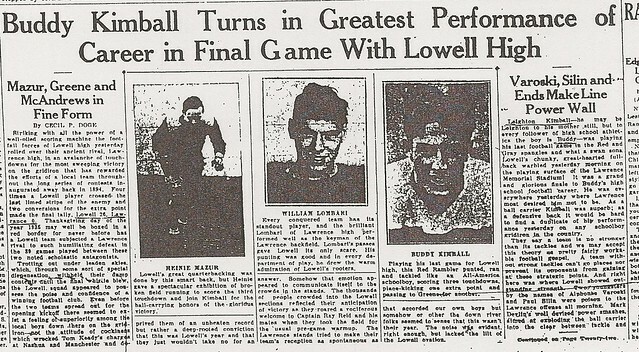 A versatile standout on the gridiron, Buddy was the catalyst for Lowell in his senior season (1935). 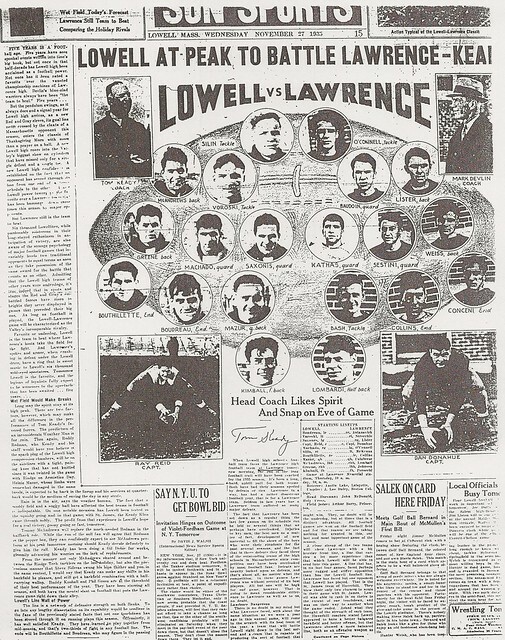 Alternating between quarterback and halfback on offense and as a defensive back on defense, Buddy led Lowell to the most successful season in its history to that point. His 9 TO’s and 55 points paced the team offensively. He was one of the key defensive players on a squad that notched 8 shutouts and outscored its opponents 144-22 en route to a seasonal record of 8-1-1. 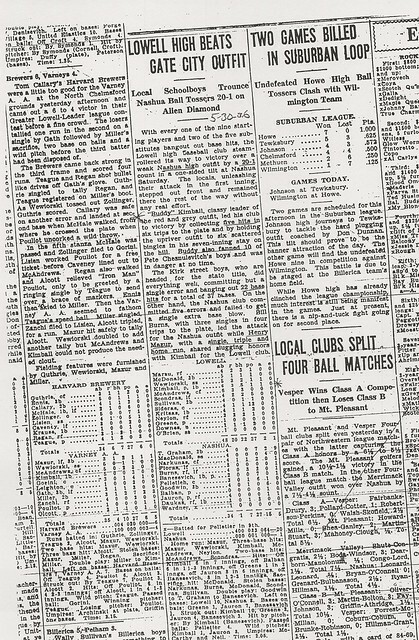 He put an exclamation on his career in his final game by scoring 3 TO’s (one on a 40-yd. 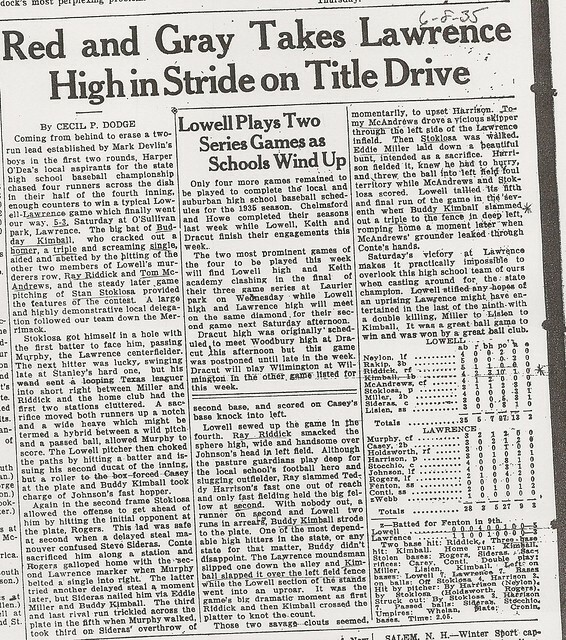 TO interception return) and an extra point as Lowell romped past arch-rival Lawrence 26-0. 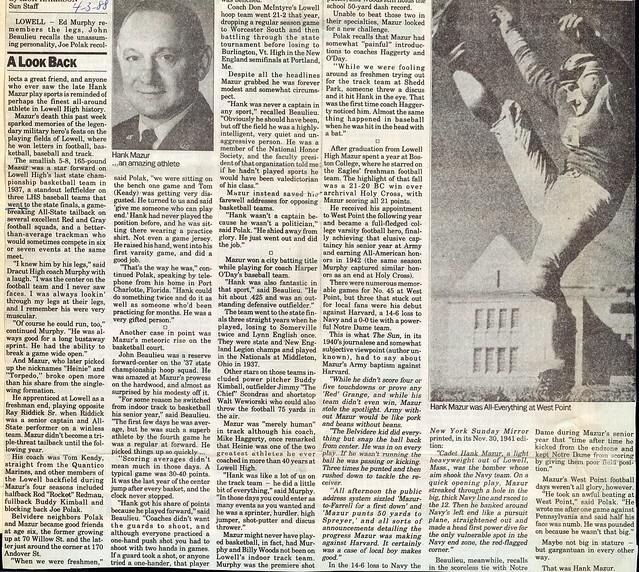 As successful as he was on the football field, the baseball diamond was the site of Buddy’ s most prolific athletic accomplishments, ranking him as perhaps the greatest offensive performer in school history. 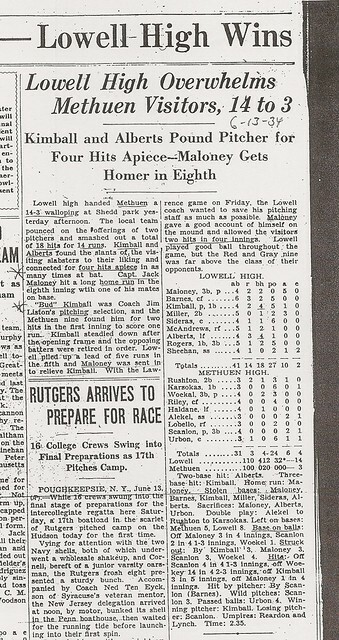 As a sophomore (1934) Buddy had an immediate impact. 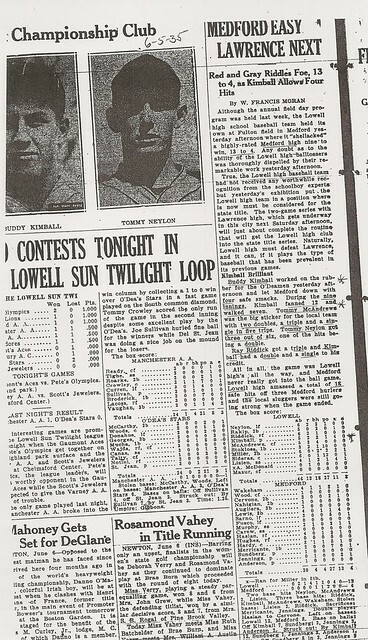 The slugging first baseman led Lowell in batting average (.392), hits, runs, doubles, and triples. 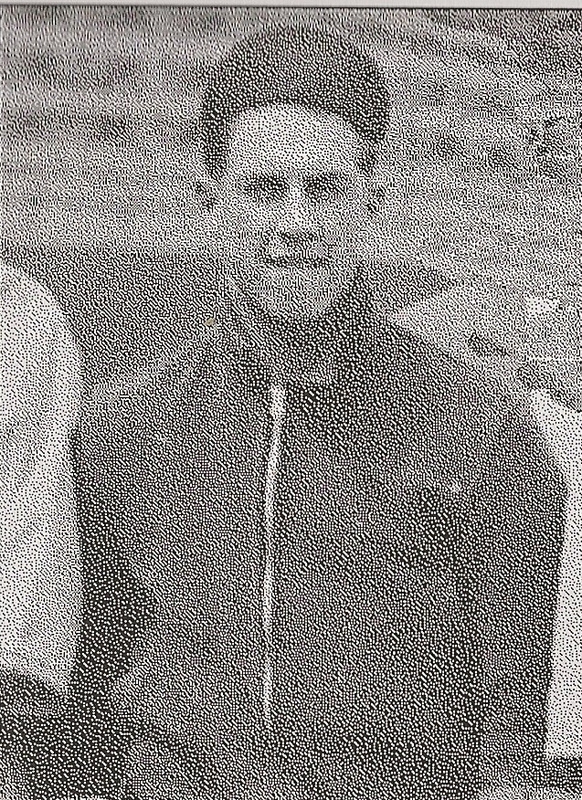 He also found the time to compile a 3-2 record as a pitcher with 32 strikeouts in 32.2 innings. 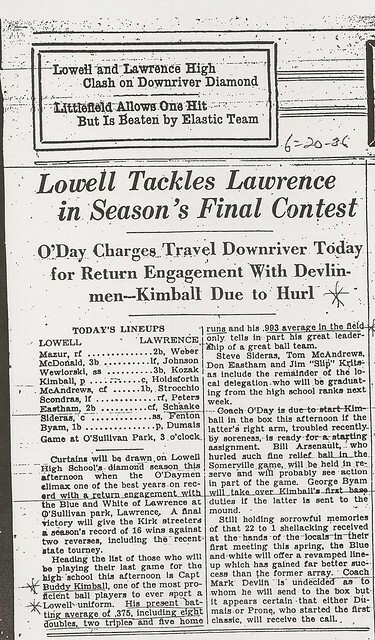 As a junior (1935) Buddy compiled arguably the finest all-around season in the long history of Lowell High School baseball. A 5-5 batting performance in the final game of the season allowed Buddy to finish the season with a .507 batting average, a school record that stood for 65 years. 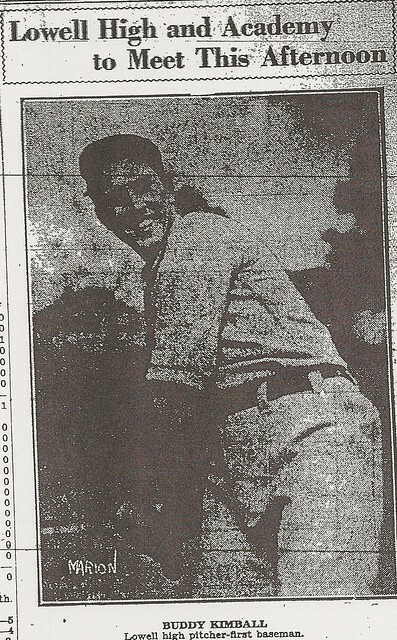 He also set school records in hits (38) and RBI’s (30), and led the team in triples, home runs, and runs scored. 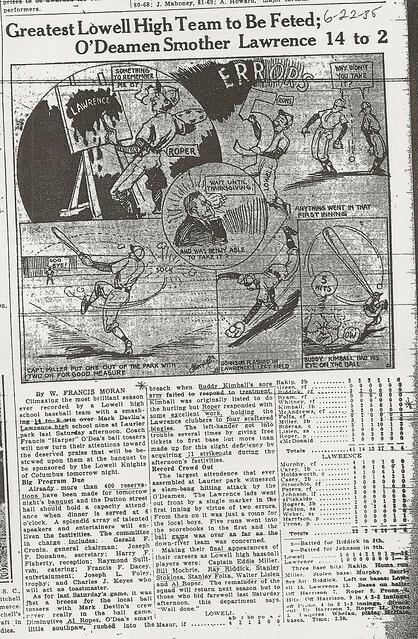 On the mound he fashioned a 5-1 record with 59 strikeouts in 51 innings. 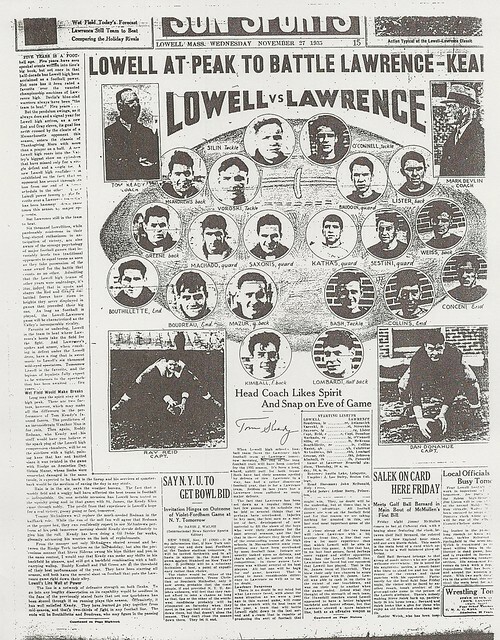 Due in no small part to Buddy’s efforts, Lowell enjoyed its greatest season to that point in school history, compiling a 16-2 record and finishing as State Runnerup after competing in the Massachusetts State Tournament. 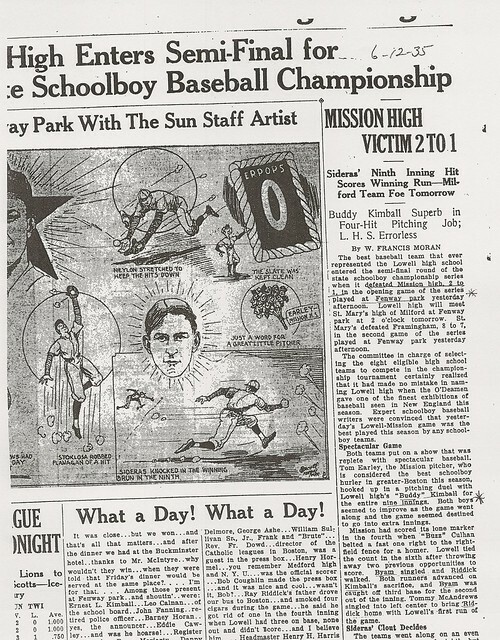 Buddy’s 4-hitter at Fenway Park in a 2-1 tournament quarterfinal victory over Mission High School was the crowning achievement of his season. 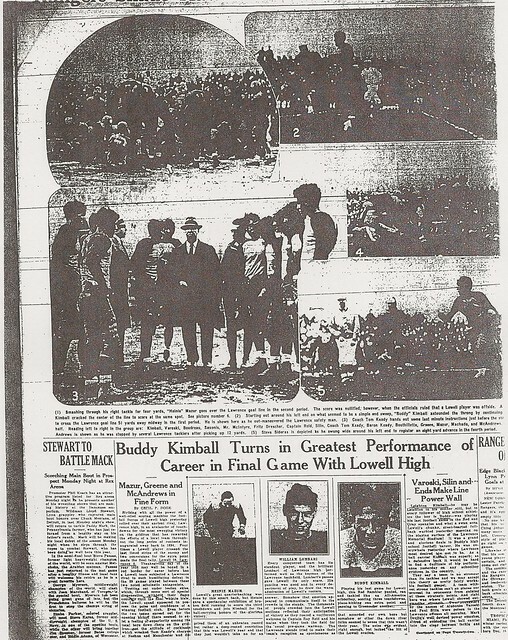 Buddy continued his exploits as team Captain during a 17-3 senior season in 1936. 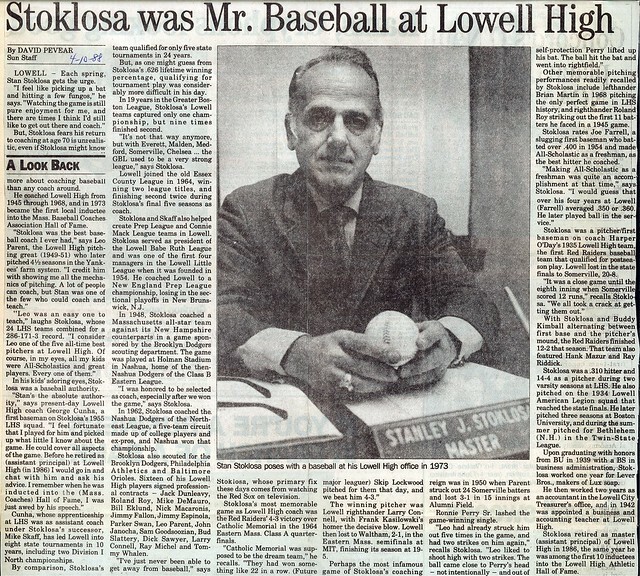 His .360 batting average included a 5-hit game against Nashua. 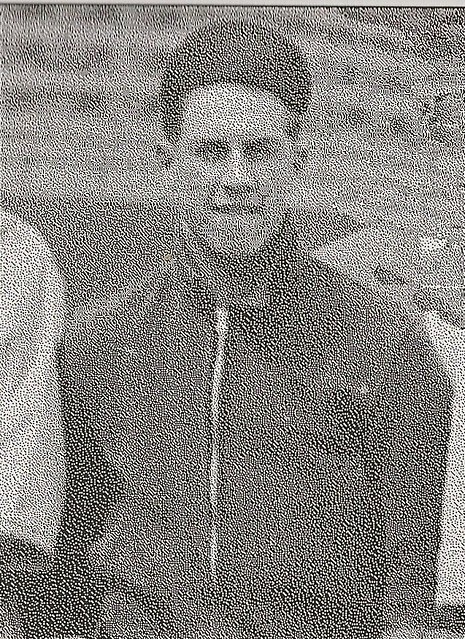 He set seasonal school records in doubles (9), home runs (5), RBI’s (37), and runs scored (33) and also led the team in triples. 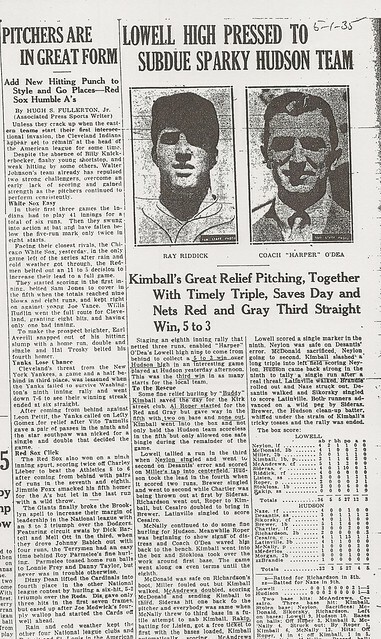 Buddy also compiled a 3-0 record on the mound with 44 strikeouts in 33.2 innings. Buddy’s phenomenal career statistics include a .420 batting average, 89 hits, a school record 82 RBI’s, 19 doubles, 8 triples, 6 home runs, and 65 runs scored. 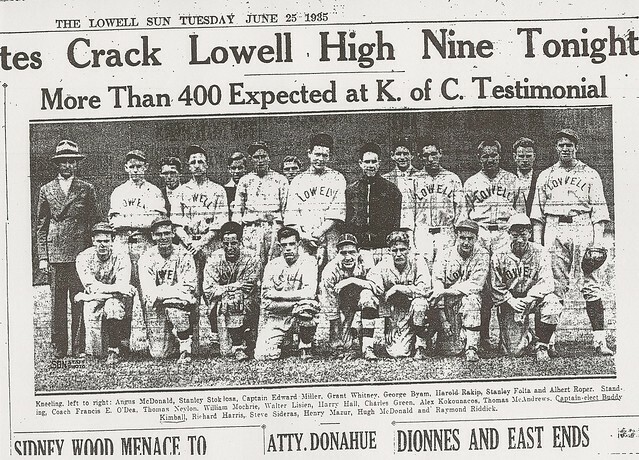 Three quarters of a century after his graduation, Buddy’s name can still be found throughout the Lowell High School Baseball Record Book, including over twenty entries that rank him in the top five in various categories. 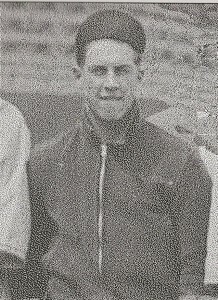 After graduation Buddy attended the University of Vermont (class of 1940). 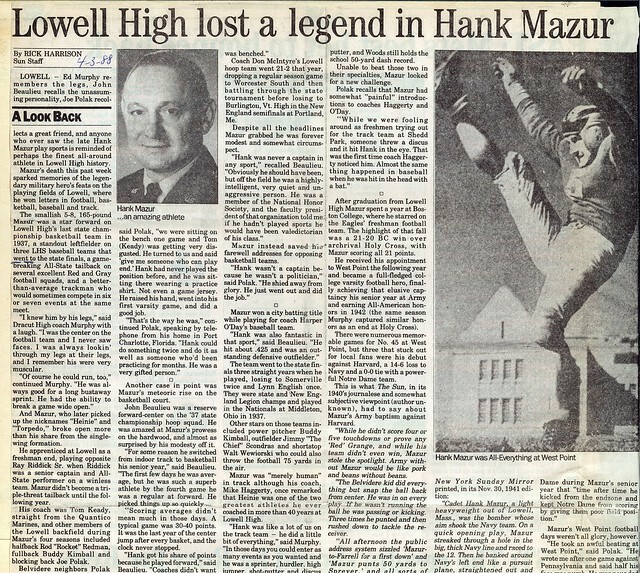 where he continued both his baseball and football careers. 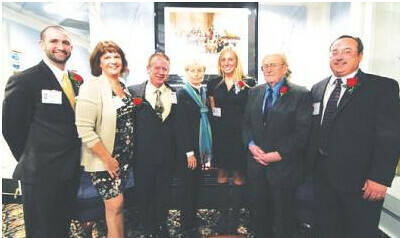 Among the illustrious teammates Buddy joins in the Hall of Fame are Raymond Riddick, Hank Mazur, Stanley Stoklosa, Edmund Murphy, John Beaulieau, and Walt Wewiorski.